The Feral50. The Beginning of the After. Ch 3. Home > The Feral50. The Beginning of the After. Ch 3. I saw her this afternoon, ”Waterbury 1.” It wasn’t the heartfelt reunion I had hoped for, but in reality visiting a feral cat who’s recently had all her teeth removed wasn’t going to be all unicorns and lollipops. ©2017 ROBIN AF OLSON. Little W1 after all her teeth were removed. It was cold in the room. I wondered if W1 was chilled from having all her fur shaved away. It was a necessary evil. 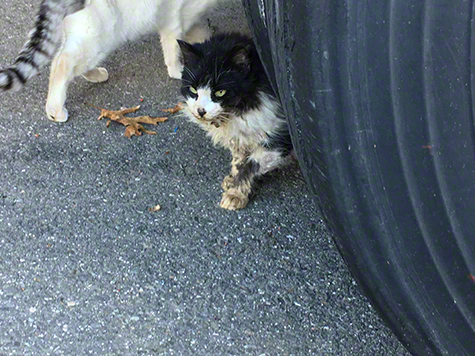 Her badly matted fur was filthy and her skin could have been damaged from the mats that tugged at her when she tried to walk. Being shaved down in January in Connecticut is the worst time to have it done, but one day her lovely coat will return. I wanted her to have a thermal core cat bed and I was mad at myself for not bringing her one. 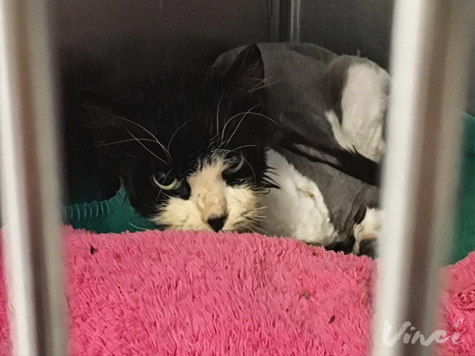 But being at a vet’s office, W1, wouldn’t have the comforts of a home because her towels would be replaced daily and any bed I brought her would probably have to be washed as often and that seemed to be a lot to ask. I’m sorry this isn’t an uplifting part of W1’s story. In a way it should be because the very worst is over for her. Her teeth are gone. Her infection is waning and no doubt her anemia will be resolving. She’s managing to eat when no one is looking. She has every chance of making a full recovery, but it will be a long road. ©2017 ROBIN AF OLSON. Respecting her fragile state I did not open the cage door to disturb her. W1 isn’t ready to leave the hospital, but I know she'll be well cared for while she’s there. I wonder if she’s missing her sister and her other friends in the feral colony. I wonder if she misses the pace of the day, of the familiarity of her home, but I can’t imagine she’ll always miss those things once she regains her strength and the comfort of a full belly. I almost didn’t recognize her when I first saw her. Her whiskers are broken off and her face is still somewhat dirty. She seems half the size she was without her fur. Her pupils are large. She sat very still, watching me carefully as I sat across from her. I know my being there scares her, so I sat on the floor, making myself as small as I could. I spoke to her in hushed tones. I reassured her that everything is going to be all right; that I’m sorry for what happened and that everyone is doing their best to help her feel good again. I slowly closed my eyes, giving her a loving blink. She almost did it back to me. In that moment I felt hope for her future, but even with pain medication I’m sure her discomfort colors her mood. I know that as long as I’m there she won’t relax and get more rest. I’m torn between the constant yearning of wanting to pet her just one time. I want to open the cage door and at least let her catch the scent of my fingers, but more than that I don’t want to upset her, so I leave her be. She’s been through so much already that risking causing her more stress didn’t feel right to me at all. My mothering instinct, my need to protect her, would have to accept that I’d done as much as I could and that holding her would not comfort her at all. ©2017 ROBIN AF OLSON. This moment will live in my heart forever. Thank you to Betsy for going back and trapping her the next day, then getting her to her vet for care. Seeing her for the first time, under the semi truck trailer is something I will never forget. Her small form, huddled against the cold, still with enough life-force that gave her the desire to eat even though each bite crippled her with pain. She walked stiffly and was covered in filth and crusty mucous. I didn’t imagine it was possible that just a week after I saw her I’d have raised enough money to get her vetting done. That just a week after I saw her, through a magical twist of fate, someone would see her in her sorry state and step forward, offering to give her a forever home, even if she may never pet this cat either. To honor W1’s dignity she has been given a proper name: Tulip. Tulip’s life is precious to all of us who have worked so hard to save it. She has a chance at a comfortable and safe tomorrow. It’s clear that her life was precious to the many people who happily donated to provide for her care, too. Together we made a second chance fully realized for this tiny tux. This is why we do rescue. May the rest of your days be free from pain and suffering, dear Tulip. ©2017 ROBIN AF OLSON. Even though you don't know it, you are loved by many both near and far. She knows that she is being helped. She's been fighting for so long, been afraid for so long, and sick for so long. 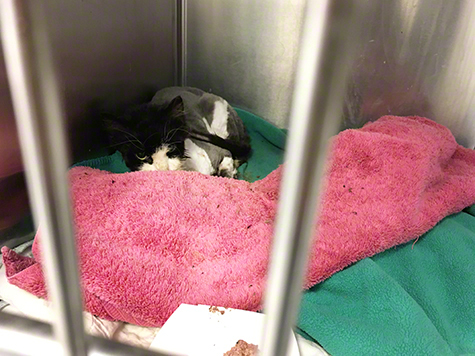 Thank you to everyone who's helped this kitty! Though NO cat should ever be abandoned and/or left out in the cold, Tulip is one of the lucky ones: she found YOU. 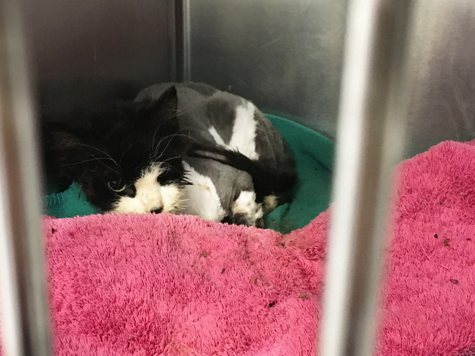 We both know that most cats in her circumstances and condition would not have made it through and been given all of the necessary treatment and caring she is undergoing. I pray her journey will be smooth from here on in, and that that loving forever home will be able to give her all the best for a long time to come. Certainly she is loved and cared about by many! Dear Robin, Hello from Brazil! Tulip and all the others cats will be fine. I just want to sey to you that you inspire me. You inspire me to be a better person, a better mother to my baby, to my cats. A better person to the world. I'm talking about life. You Taught me so so much. Thank you! !